The nation’s fourth biggest bank by assets pays one of the industry’s most generous and durable dividends. 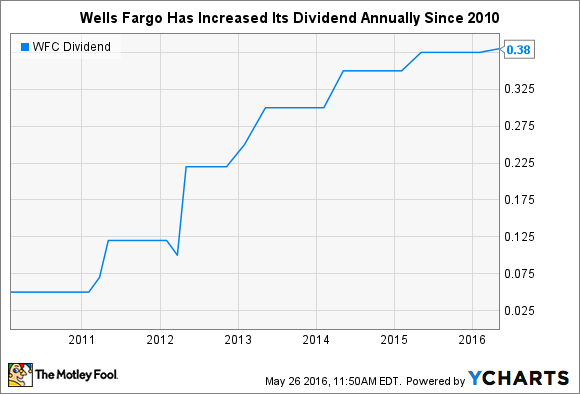 If you're looking for a good dividend stock in the banking sector, you could do a lot worse than Wells Fargo (NYSE:WFC). The 154-year-old bank has made its quarterly payout a priority over the years, and its dedication to distributing profits is alive and well today. The first metric most investors look at when picking dividend stocks is the yield. This compares a bank's annual payout per share to its share price, and is calculated by dividing the former by the latter. There is no hard-and-fast rule when it comes to the dividend yield. Some companies, such as real estate investment trusts, have high yields because they're obligated to pay out 90% of their taxable income to shareholders each year. Others, such as young technology companies, choose to reinvest all of their income back into their operations and thus have a 0% yield. When it comes to mainstream stocks, including most of the S&P 500, it's more of a Goldilocks analysis. That is, you want to avoid yields that are either much higher or lower than the S&P 500's average, which is currently 2.2%. Wells Fargo's yield is 3.1% right now. This ranks the California-based bank in the top quartile of S&P 500 stocks. This is right in the sweet spot for income-seeking investors; it exceeds the average, but not by a worrisome margin. The main reason that investors needn't be worried about Wells Fargo's dividend is because it distributes only 37% of its net income each year, according to Yahoo! Finance. This is known as the payout ratio, which is calculated by dividing a stock's dividend per share by its earnings per share. There is similarly no hard-and-fast rule with respect to the payout ratio, though there are two points to keep in mind. The first is that Wells Fargo distributes a much smaller share of its earnings than the typical stock on the S&P 500, which averages a 67% payout ratio. With respect to banks in particular, moreover, most aim to allocate their earnings equally among dividends, buybacks, and retained earnings. That would equate to a payout ratio of 33%. This is roughly in line with Wells Fargo's, and should thus give an investor confidence in the sustainability of the bank's dividend. There's also reason to believe that Wells Fargo will grow its dividend in the years ahead. It's done so every year since 2010. And its streak would have gone back further had it not been interrupted by the financial crisis, which caused all but a small handful of banks to slash their quarterly payouts in order to preserve capital. WFC Dividend data by YCharts. On top of this, it's fair to assume that Wells Fargo's profit will rise over time. The $1.8 trillion bank has consistently grown its bottom line for multiple decades, and with an eventual multibillion boost from higher interest rates at some point in the future, there's bound to be even more distributable dosh in Wells Fargo's coffers in the years ahead. In short, I've said it before about Wells Fargo's dividend, and I'll say it again. For investors with a penchant for bank stocks and dividends, the nation's fourth biggest bank by assets has just about everything an investor can reasonably hope for.